You are probably thinking that you must take your car to a repair shop to get the work done you need. This is just not true. A mobile mechanic is just that. They take their supplies, tools and everything they need with them. Auto parts services you would be surprised that can be fixed with our Scottsdale Mobile Auto Repair, in Scottsdale, AZ. Scottsdale Mobile Auto Repair is a full-service mobile roadside assistance mechanic company, we fix, repair or replace radiators, AC, brakes, batteries, cold weather problems, add snow chains, car not cranking or won't run properly. You don't have to call or pay for a wrecker, we will come to you and you will pay less, save more money and more importantly save your valuable time. Whether your car problems are big or small Scottsdale Mobile Auto Repair can handle them all, give us a call today and let us prove our quality mechanic work and great customer service. No matter wherever you are, our experts will be right there to help you in any condition at any time. 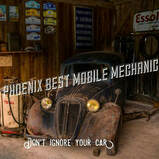 Just let us know at 602-975-4967 and Scottsdale Mobile Mechanic will reach out to you within a very short time.